A Little Bit of Knowledge? It has been said that a little bit of knowledge is a dangerous thing, and the following account should seal the truth of that statement. Like most specialized sports fly-fishing has its own jargon that may only be appreciated by those individuals who have bothered to attempt to understand the sport in which they are actually trying to participate. Unfortunately, it has been my experience in recent years that more and more individuals are attracted to the sport without any previous angling experience. The results are mostly very, very funny. The following true story amply illustrates this point. The location of this event is irrelevant to the story, but suffice it to say that it took place on public water in the heart of trout country, and on a stream that is regularly fished by some of the best fly-fishers in the world. 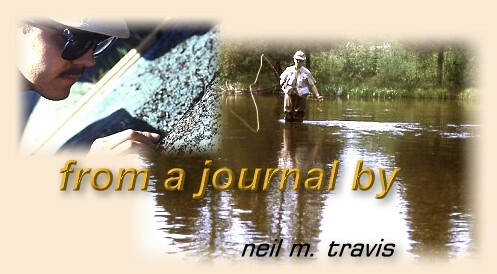 It was an early July morning, and my friend, a long time guide and outfitter, and his client had just arrived on the stream for a day of fishing. Walking down to the river they selected a suitable place to begin fishing, and as they were watching the water for insect activity another group of anglers approached, and inquired if they were going to fish the water immediately upstream. My friend told them that they were not intending to fish that water, and the trio then preceded to head in that direction. It should be noted that the trio were all properly attired with waders, fly rods, and vests and my friend did not give them any further thought. Later that morning my friend and his client were sitting on the bank resting the pool. His client had caught several nice trout during a brief hatch of mayflies, and they were waiting to see if the pool would produce any further action. It was at that time that their attention was directed to one of the anglers they had encountered earlier. He walked down the bank behind them and waded into the water about 30 yards downstream. As he stood in the water he took something out of his vest and attached it to his leader. The object appeared to be some form of a strike indicator, but it looked strangely like a small red and white plastic bobber. With much effort the angler proceeded to fling his offering out into the stream, and after a brief float he attempted to pick it up for another cast. With a loud 'pop' the object rocketed off the water and hit the angler right in the face! After rubbing his face for a moment the angler proceeded to try again, but despite his attempt to dodge this unguided missile it struck him again. The humor of this scene was too much for my friend and his client, and they were laughing so hard that tears were running down their faces. After watching this poor fellow repeat this performance several times my friend walked down the bank to where the angler now sat rubbing his face. "I couldn't help but notice," said my friend, "that you appear to be having a bit of difficulty with your casting." "Well, I've never done this before, and I can't seem to get the hang of casting this thing," he said. "Why do you have that plastic bobber on your leader?" my friend inquired.